I love miniature potatoes. They’re fun to work with. They make wonderful hors d’oeuvres, are the perfect size for roasting, and are the ideal size to drop into soups just the way they are without cutting them up. Through the Food Bloggers of Canada association of which I am a member, an opportunity arose this fall to take little creamer potatoes produced by the Little Potato™ Company of Alberta and create an original recipe using the potatoes. 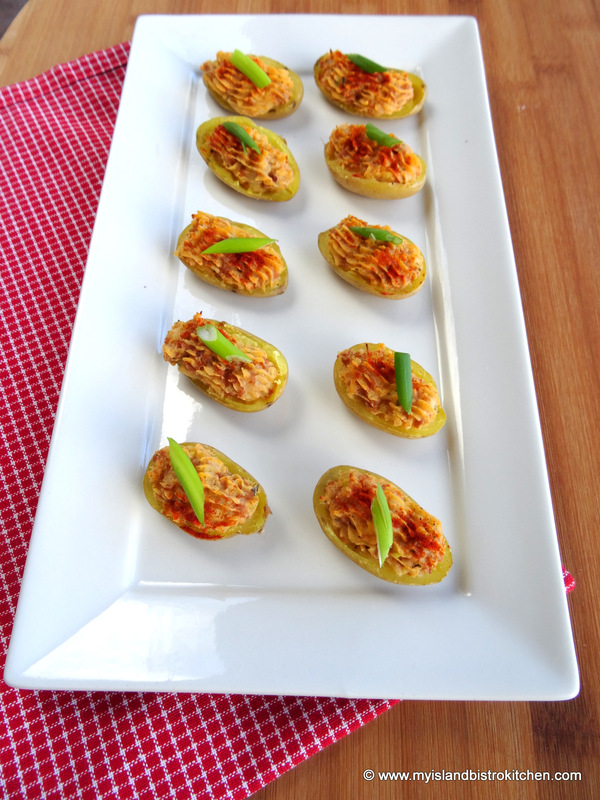 Coming into the Christmas party season, I immediately saw them as potential hors d’oeuvres. The Little Potato™ Company grew their first acre of tiny potatoes in 1996. A father and daughter team, Jacob Van der Schaaf and Angela Santiago, planted, weeded, and harvested the first crop by hand. It was a success and soon Angela began marketing the potatoes at Farmers Markets and to restaurants. 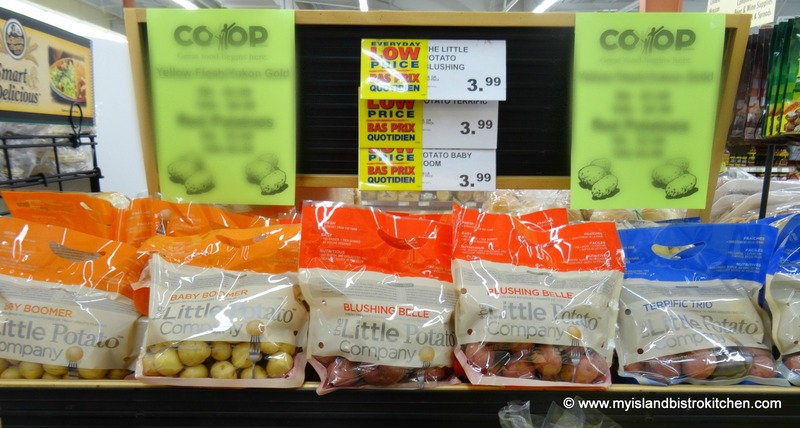 The tiny potatoes grew in such popularity that production expanded and, today, the Little Potato™ Company grows six varieties of the little gems which are available at grocery stores across North America. To learn more about The Little Potato™ Company and their various varieties of miniature potatoes, visit their website. You can also find them on Facebook. 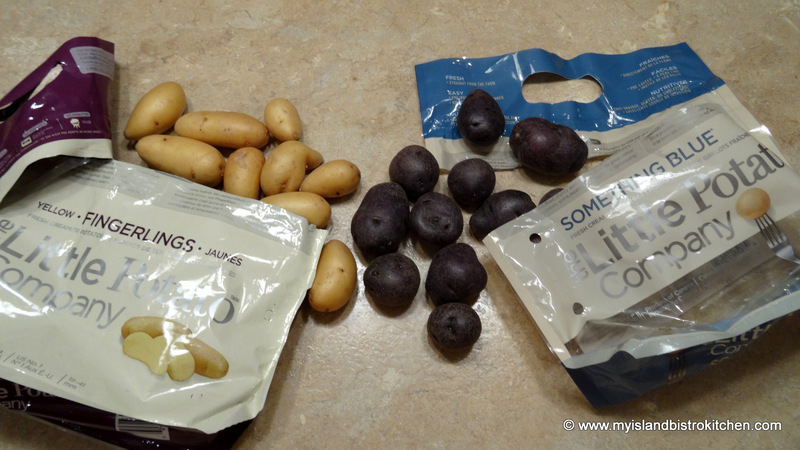 Two bags each of Little Potato™ Company yellow fingerlings and Something Blue® mini potatoes arrived via UPS at my door one evening. 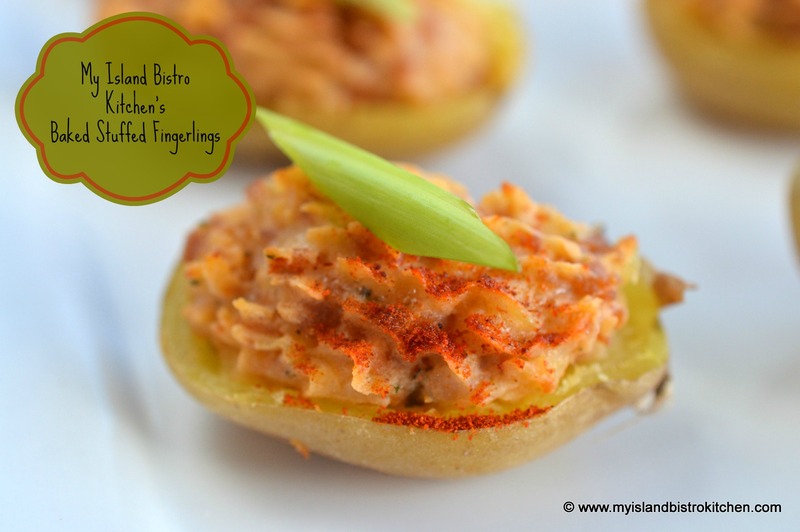 I was thrilled that the oblong fingerlings were sent since they are the perfect shape and size to use when making miniature stuffed baked potato hors d’oeuvres. 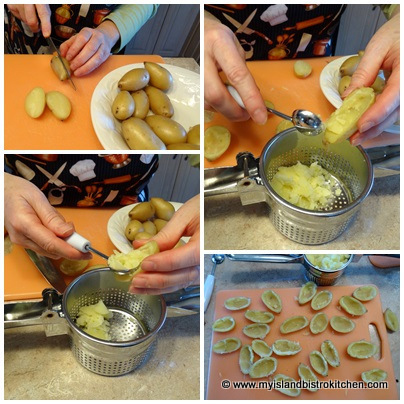 The recipe I have created especially for these little creamer potatoes can also be used to stuff mini round potatoes as well but the shape of the fingerlings really lends them to being stuffed attractively. Any flavour of sausage can be used in this recipe. My choice is sweet Italian but, if you like hot flavours, then chipotle would be a good option. 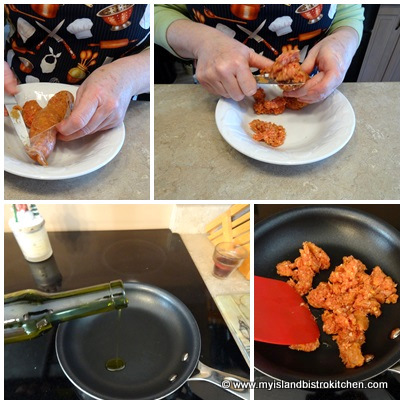 The sausage needs to be removed from its casing and it is important to break up the sausage meat really well as it is being scramble-fried because it is going to be piped through a pastry bag. Also, its purpose is to add flavour to the filling and a large chunk of sausage is not desirable in a tiny hors d’oeuvre. 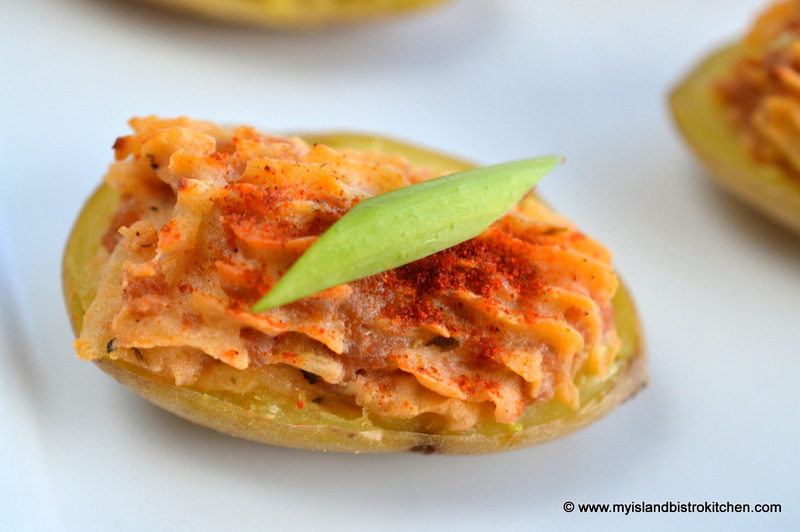 It’s also necessary to extract as much fat as possible from the cooked sausage as the fat can drip through the potato skin and make a messy hors d’oeuvre. To remove the fat, let the cooked sausage drain in a colander for about 15 minutes then wrap the meat in paper towel, repeating the process a couple of times, if necessary, to remove the excess fat. The little fingerlings take about 15 minutes to cook. Once they are removed from the boiling water, just barely let them cool enough that they can be handled. Slice each fingerling in half, horizontally. 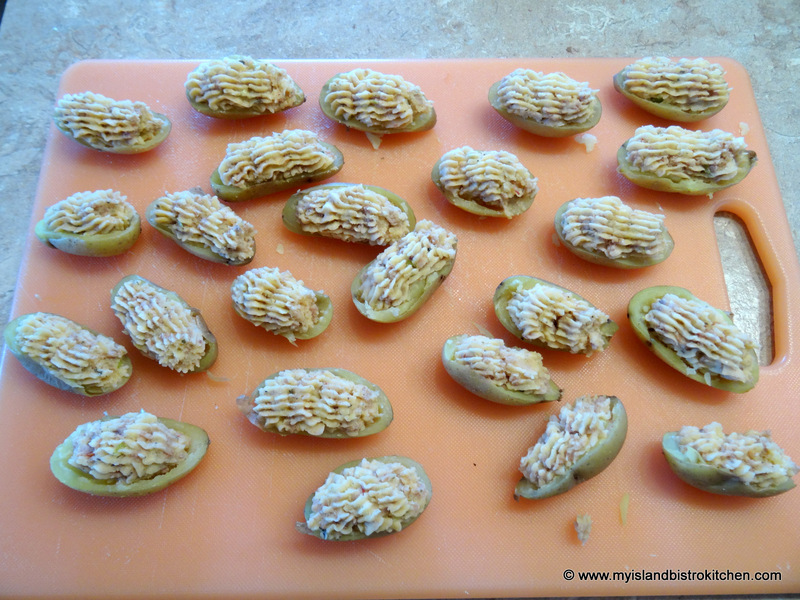 Then, using a melon baller, remove the potato pulp, leaving about a 1/16th inch thick wall of potato in each half to give the potato shape. 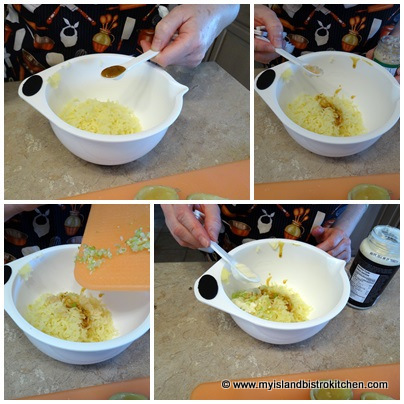 Transfer the potato pulp to a potato ricer. 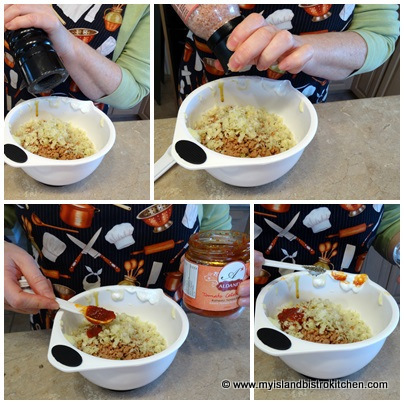 Press the potato through the ricer into a small bowl. The potatoes can be mashed instead of ricing but the potato ricer gives a smoother, finer texture that is completely lump-free. Add the remainder of the ingredients to the riced potato and mix well. 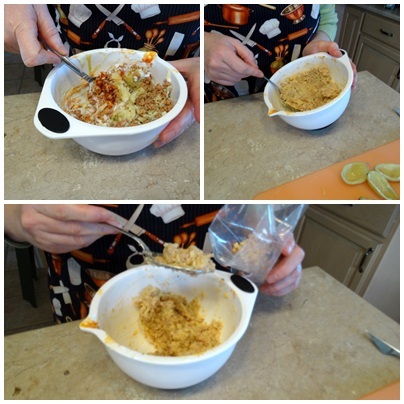 The filling can be transferred to the potatoes with a spoon but a piping bag and Wilton tip 8B makes the job quicker, easier, and will give a neater presentation. 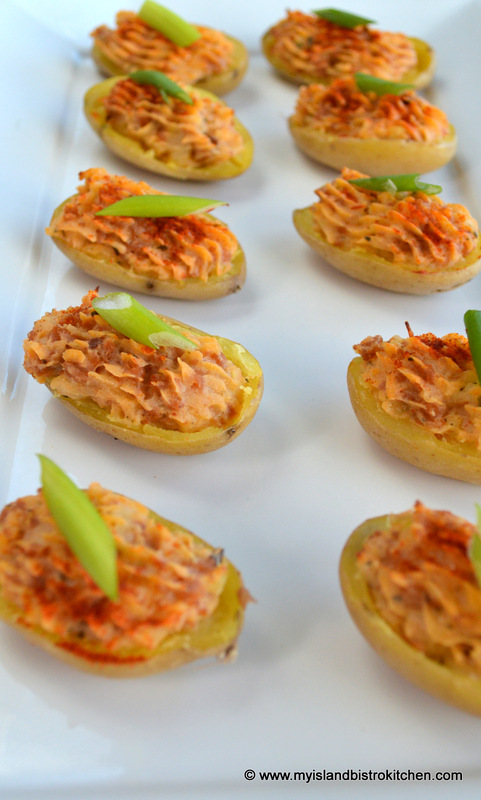 Add a sprinkle of paprika, and pop these little hors d’oeuvres into a 375ºF oven for about 12 minutes. Use either a parchment-lined baking sheet to bake the stuffed potatoes or, if you have a baguette pan, it works really well, too. Garnish, if desired, with a sliver of green onion or chopped chives, then serve to the delight of guests at your next party. Heat olive oil in small frypan. 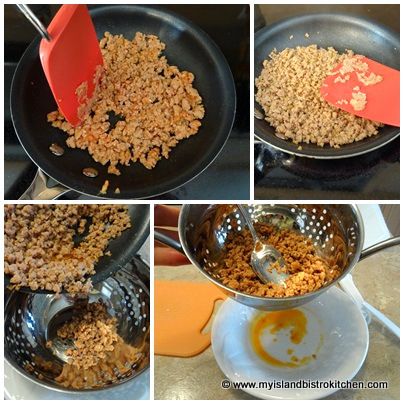 Remove sausage from casing and crumble. Add to hot oil. With the end of a flat, heat-resistant lifter or spatula, continue to break up the sausage as it cooks. Scramble fry until sausage is brown, approximately 7-10 minutes. Transfer sausage to a colander and let fat drip out for about 10-15 minutes. 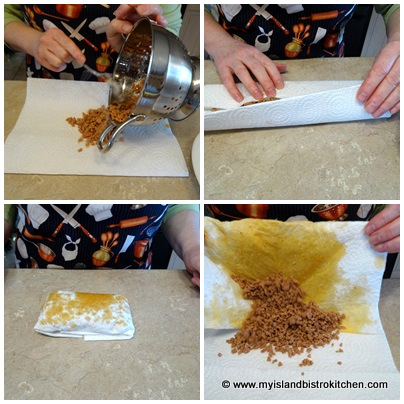 Then, roll the cooked sausage in paper towel to remove any remaining fat. Set aside. Cook fingerling potatoes in boiling water for about 15 minutes or until fork tender. Remove from heat. As soon as the potatoes are just cool enough to handle, cut each in half, horizontally. 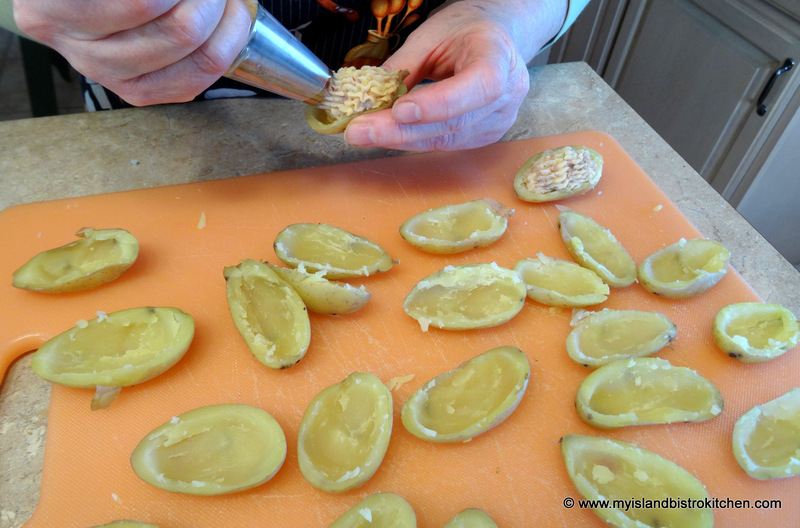 Using a melon baller, remove the potato pulp from the skin, leaving about a 1/16th inch thick wall of potato in each half to give the potato shape. 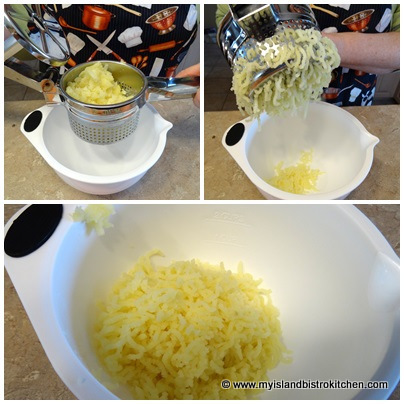 Transfer potato pulp to a potato ricer. Press pulp through ricer into small bowl. 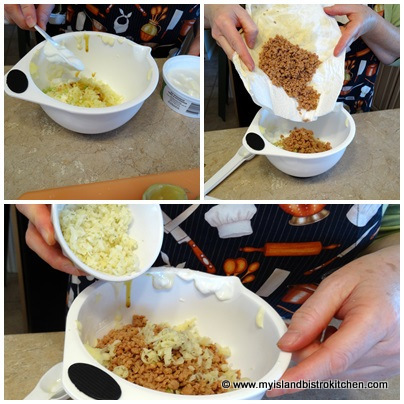 Add remaining ingredients and mix until incorporated. Transfer mixture to a pastry bag fitted with Wilton tip 8B. Pipe filling into each fingerling half. Sprinkle with paprika. Place mini stuffed potatoes on a parchment-lined baking sheet or in the cradle of a baguette pan. Bake in preheated oven for about 12 minutes. Remove and garnish with a sliver of green onion or chopped chives. Serve hot. Disclosure: The potatoes used in this recipe were provided to me, free of charge, from The Little Potato™ Company for the purposes of sampling them and creating a recipe with them. 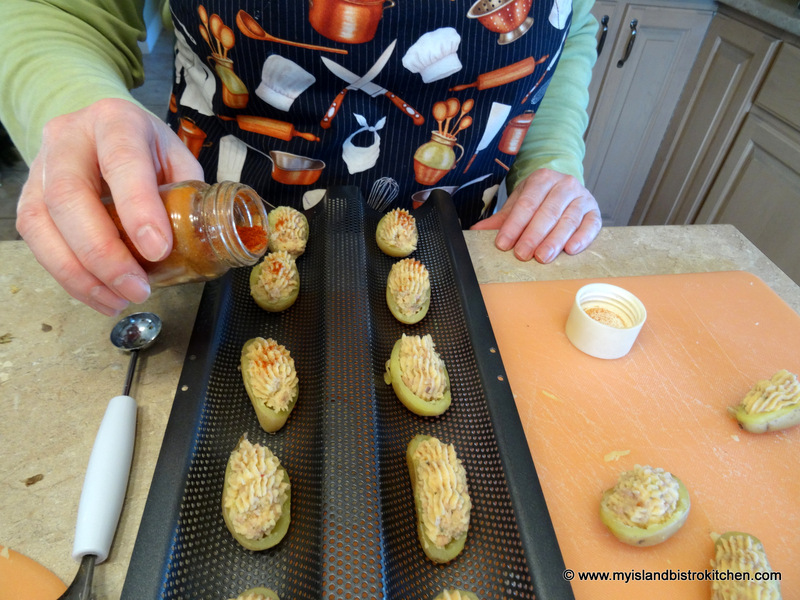 The recipe for Baked Stuffed Fingerlings in this posting is an original recipe developed by me in my home kitchen.